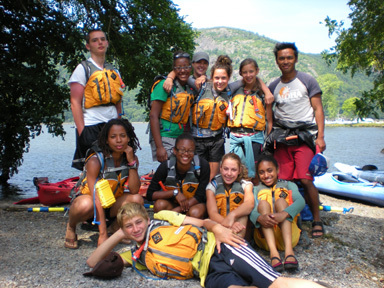 Camp Clearwater is an adventure-based leadership program based in Beacon, NY, on the historic Hudson River. Students develop self-confidence and learn new skills while being challenged both physically and mentally. They also develop knowledge and respect for the natural world and leave the program having experienced first-hand the history, ecology, and culture of the Hudson River Valley. All board meetings are open to members to attend. Meetings are held at the Clearwater offices in Beacon, NY, unless otherwise indicated. Just in time for cold weather! A full-zip hooded sweatshirt made of 70% recycled cotton/30% recycled polyester. These stylish and comfortable hoodies bear the full-color logo embroidered on the left crest. Mens' available in Sweat Blue and Grass Green. On December 13th, several regional environmental groups came together for the Conference and Dialog on Water Resources. Clearwater, along with several partner environmental organizations, joined the NYSDEC Hudson River Estuary Program in sponsoring the full day conference held at SUNY New Paltz. The focus of the conference was to seek and create a shared understanding of the challenges and opportunities confronting the Hudson Valley as we manage our water resources, with the goal of fostering a dialog in order to move forward in a positive direction for the benefit of the region, its watershed, and its people. Clearwater led the breakout session, Green cities, clear waters: how do we work together to create synergies for jobs, housing and water? executive director, Jeff Rumpf, Clearwater board member, Alma Rodriquez, and Clearwater Environmental Action team members, Victor-Pierre Melendez and Jen Rubbo facilitated the discussion on how community involvement, education and organization provide the foundation for successful green infrastructure. Other breakout topics included regional water asset management, water conservation, aligning land use with water and economic goals, and waterfront revitalization as an economic strategy. Fran Dunwell, Hudson River Estuary Coordinator, served as facilitator for the symposium. Representative Maurice Hinchey provided an inspiring keynote message during lunch. Central topics of discussion highlighted the need for better community education as to what green infrastructure means. Consensus also supported the idea that the DEC website could operate as a resource for green infrastructure issues. Sloop Clearwater "Open Boat Family Days"
Friends and family's are welcome to come check out the boat, meet the winter crew and cozy up in the shop to share stories and songs. 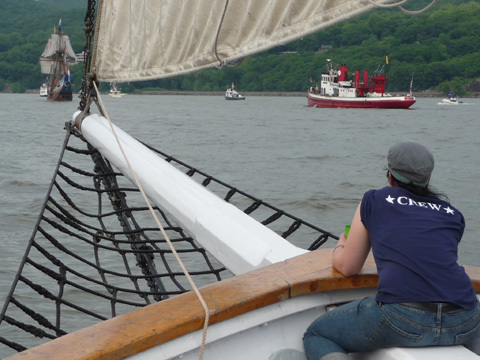 Are you interested in teaching and sailing on the Hudson River? 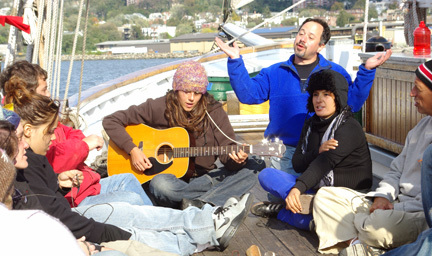 Our Education Team announces volunteer openings and employment opportunities onboard the sloopClearwater and our sister ship Mystic Whaler for spring 2011. Volunteering on the boats is a rewarding way to become part of the Clearwater family. You will be teaching hundreds of students about the Hudson River onboard one of the historic vessels as a member of the crew living aboard for a week. We are looking for enthusiastic people 18 and older who love working with young people, enjoy the outdoors, and are comfortable with rustic living conditions. Our sailing season begins in early April and runs through the end of October. Please note that we are currently scheduling only weeks in April, May and June, 2011. To apply to volunteer with the sloop Clearwater, please click here. One of our educators will call you for a short interview over the winter. Onboard Educator Opportunities: Clearwater is hiring qualified staff to lead our education programs onboard Clearwaterand Mystic Whaler for the upcoming spring sailing season. Live onboard, become part of our crew, sail an historic tallship, teach thousands of kids about the Hudson River and get paid for it! For more information and applications please visit our website to view our Job Openings. Clearwater's Education Internships are 2 to 3 month, paid, live-aboard positions for someone with environmental education background and experience leading teenagers in outdoor adventures. Sailing experience is not necessary. For more information and applications please visit our website to check out our Internship Opportunities. For more information, contact Maija Niemisto at 845-265-8080, ext. 7115, or email Maija@clearwater.org. The Walkabout Clearwater Coffeehouse is the second-Saturday, October through May, concert series is in its 20th season. Ample parking, smoke-free environment, refreshments available before the show and during intermission. Proceeds support Walkabout Clearwater and the Hudson River Sloop Clearwater, Inc.